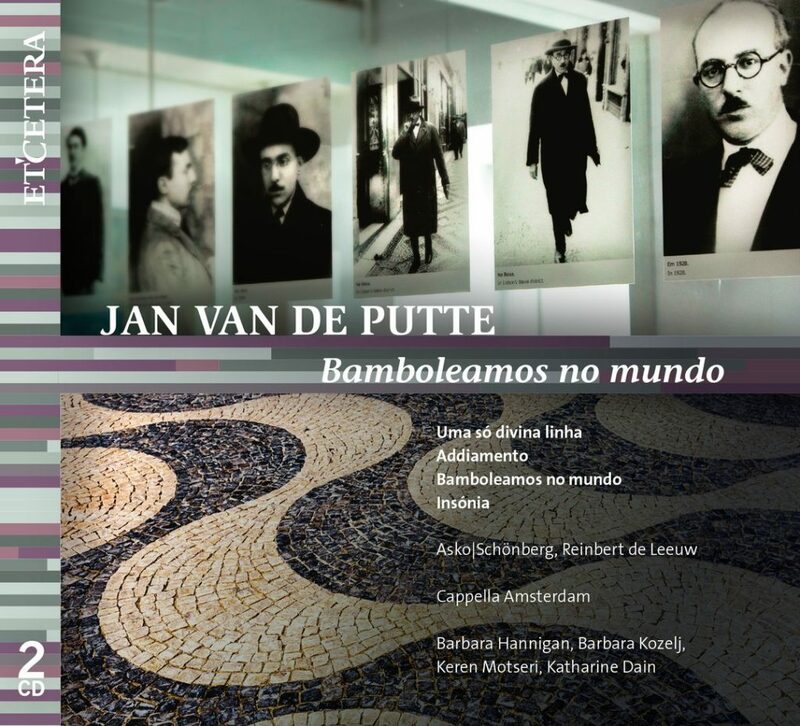 On December 3rd, my first commercial recording as a soloist will be released on the Etcetera label: a live recording of the world premiere in Amsterdam’s Concertgebouw of Insonia, one huge movement from Dutch composer Jan van de Putte’s monumental Pessoa-Cyclus. The CD, which also features sopranos Barbara Hannigan and Keren Motseri, mezzo-soprano Barbara Kozelj, Cappella Amsterdam, and Asko|Schönberg under the direction of Reinbert de Leeuw, will be available for purchase here in a few weeks. It’s worth mentioning, I suppose, that this performance was a jump-in. I got a call a day before the first rehearsal from Asko’s production manager, telling me in a voice of barely suppressed panic that the Swedish soprano originally booked for the gig had backed out, and would I consider learning the piece for Saturday’s afternoon performance and live broadcast? Although I had another performance planned for the same evening in a different city, I started to try to think of ways to make it work. I was sent a .pdf of the score to read through before committing, as two other sopranos known for their work in new music had already looked at the score and said no–hence the panic of the producer. (It’s a crazy, crazy sing, complete with high Fs and low As and everything in between, all in Portuguese.) I glanced at every page, mentally took the madness in stride, and told the production manager that I would give it a try; Jan, the composer, agreed to rewriting one or two phrases if I really couldn’t sing certain parts. In the moment, I wasn’t particularly nervous–it’s a weird skill I have, learning music really fast, and I knew that I would do as creditable a job as anybody. The piece was interesting, all the collaborators were great, the fee was good, it was in the Concertgebouw, Asko offered a car service for me to get to my gig that evening–there was no reason not to, really. I had a houseguest when these calls began to come in, and we had dinner plans; once I had said yes to the project, I temporarily excused myself, tucked myself away with the score on my laptop screen, and learned it with a tuning fork in an hour or so (I didn’t even have a keyboard at home at that point). I couldn’t practice it for longer than that anyway, as it was so vocally demanding. Tuning fork stowed, we went out for dinner. I showed up the next morning early at the Muziekgebouw, got a hard copy of the score, and I did my best in the first tutti rehearsal. I was prioritizing rhythm: I’ve learned that in most scores outside of standard rep, if you keep good rhythm and stay with the conductor, you’ll convince most people in the room that you’re singing it right even if you miss some pitches. At that time, and actually until very recently, I had no idea that it would be released; there was no sense of posterity or thinking at all beyond the performance date itself. But it was very successful. In the end, I actually did sing the highest printed notes in the score (though I’m not putting myself up for Queen of the Night any time soon), without asking the composer to rewrite anything. I had an immensely lovely soprano colleague with perfect pitch (which I don’t have) who oriented me very quickly and did everything she could to help me in our duetting moments–and stuffed as much Portuguese coaching into my head as there was time for. The choir, Cappella Amsterdam, was full of friends who were rooting for me. I finished the performance, sweating mightily; had a box with a congratulatory card (which I still have) and a couple beautiful pastries tucked into my hand by a dear friend who was singing in the chorus; changed out of my gown; accidentally stole the key to my Concertgebouw dressing room in my haste; bundled into a taxi. I ate a mini lemon tart in the back of the car between naps during the hour-and-a-quarter drive to Zwolle, where I then sang a performance of a multidisciplinary opera made up of chamber music of Arvo Pärt. I’m not really sure how I got through that performance, but I did. I deliriously drank a beer on the train home that night. And a lot of people heard the Concertgebouw performance, it turns out. People still occasionally will put together my name with that afternoon and compliment me on it. The composer likes it enough to release the whole thing on a commercial disc. If I had known any of that at the time, I would have been much more nervous. These sorts of crazy situations make all the difficulties of this career worth it, I think.